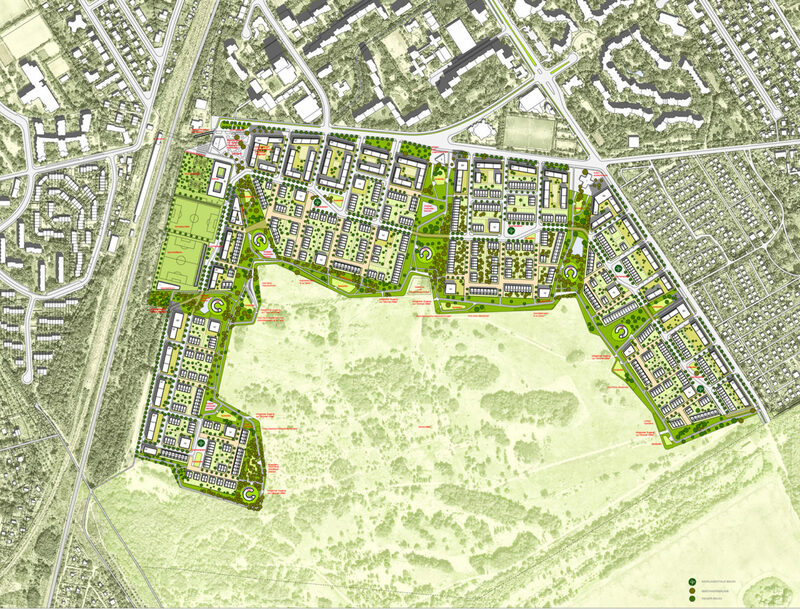 Hybrid City works as an “urban connector” that links the inhabitants living in the new development and in the surrounding neighborhoods with the Green Heart. But Hybrid City also aims to connect people: on the one hand the inhabitants living in the different quarters of the Hybrid City among them, and, on the other hand, these inhabitants with their neighbors. Hybrid City proposes a multi-scale urban development created by articulated parts at different scales. It is spatially formed by six quarters organized around the Green Heart and five Green Fingers. Each Quarter is created by a group of Hybrid Clusters articulated around the Quarter’s Square. Each Hybrid Cluster is formed by joining several “housing groups” around the collective spaces. 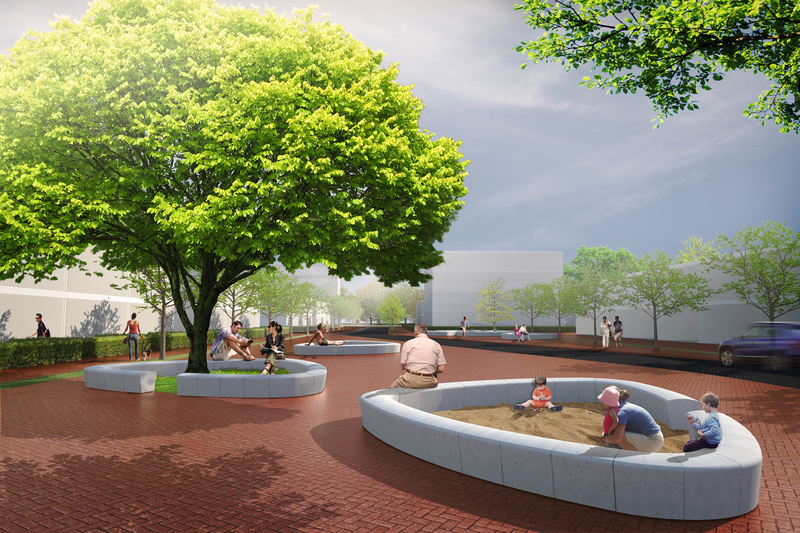 This fractal organization of the space promotes a varied urban life organized around different types of open spaces, which become important social spaces for citizens to meet and to share. At large scale these spaces promote the public life, at medium scale the neighborhood feeling, while at small scale the feeling of community. All together create a city at the scale of the citizen characterized by a “sense of place”. The plan promotes the creation of an alive and dynamic neighborhood that provides affordable housing for different kinds of people, a wide range of facilities and mix of functions. It is articulated following the concept of “Hybrid City” that explores the mix of compatible activities and the social integration of different social groups and people of different ages. The plan proposes 9 different housing typologies to respond the necessities of different social groups. Among these typologies, the flexible living and working one allows for a small office space or a shop on ground floor, connected to the living area. This typology will give liberal professionals and small business the opportunity to start their own business in the neighborhood, in order to avoid creating a dormitory neighborhood where inhabitants have to commute daily to central Berlin. This strategy will create an alive neighborhood where people will have the possibility of living and working in the area. The plan avoids creating a strong differentiation among the different Quarters. The Quarters present similar variety of housing typologies because the typologies are distributed homogeneously. At the same time, some of the Quarters concentrate more commercial facilities, others more educational ones, other quarters have more businesses and other cultural facilities. All the quarters are located in direct contact with the Green Heart and mix residential and leisure facilities, which makes them equally attractive to live and work close to nature. The plan proposes a hybrid mobility system that seeks to reduce the daily commuting, minimizing the use of private vehicles by complementing it with other kind of transportation systems. The plan is based on five points: reducing transport necessity, improving connectivity with the train system, improving the net of public bus, creating new bicycle paths and promoting a sharing car system. 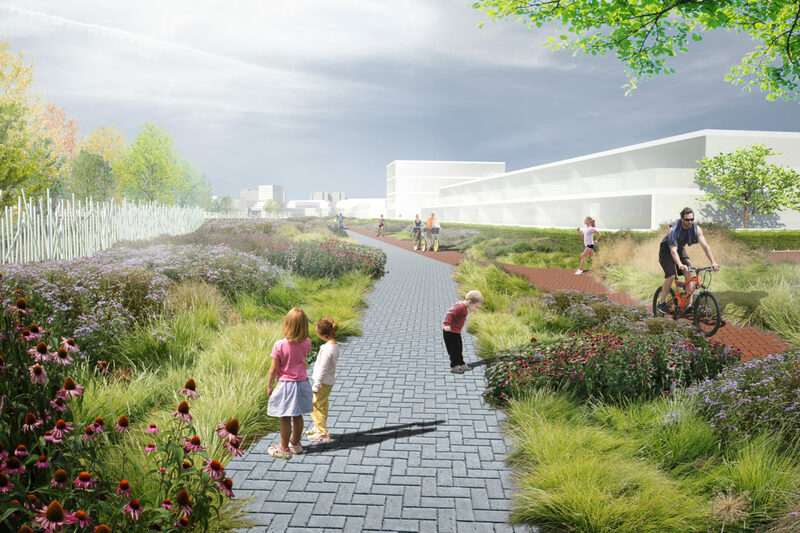 Hybrid City proposes a traffic system that mixes the conventional traffic scheme used in the surroundings of the site that segregates cars, bicycles and pedestrian circulation with a shared pavement area that mixes those different kinds of circulations in the area around the Green Heart. – Six monumental trees, located at the end of the visuals axis, will work as urban landmarks. They will mark the position of the six Quarter Squares signifying them as a place to meet, to talk and to play under their protecting branches. – Hedge as visual unifier: each Hybrid Cluster is surrounded by a continuous hedge 1m. high that reinforces the unity of the cluster and its collective identity. On the one hand, each Hybrid Cluster uses a different species creating a subtle chromatic contrast, which differentiates it from the rest. On the other hand, the constant use of hedges throughout the whole neighborhood unifies visually the area. The plan protects the areas with higher ecological value by integrating them into the Green Heart and the Green Fingers. A Sustainable Urban Drainage system, low energy consuming urban lighting, and the location of higher buildings with double facade at the border of the urban development will reduce rainwater discharge, energy use, light pollution and noise impact in the residential area.